We are very happy to announce that Glovius for Windows is now available in simple & cost-effective monthly subscription plans. Glovius is the first CAD viewer to support subscription payments. We have launched three plans, starting from $19/month. Click here to compare plans and sign-up for a free 7-day trial. All plans include full measurement, sectioning, PMI and mobile format export. – Glovius Basic plan ($19/month) opens JT, STEP, IGES, STL, Rhino, 3D PDF, VDAFS, VRML, COLLADA, 3DS & OBJ files. Sign up for Basic Plan. – Glovius Standard plan ($29/month) supports viewing of Pro/Engineer, CREO, SolidWorks, Inventor, Solid Edge, OSDM, CADDS files. Add markups and save files in the JT format. Includes all features from Basic plan. Sign up for Standard plan. – Glovius Pro plan ($39/month) supports viewing of CATIA V4/V5, NX, I-DEAS & Parasolid files. Export to STL and compare any two models, based on differences in geometry, attributes, product structure. Includes all features from Standard plan. Sign up for Pro plan. The tools you need, at an affordable and clear price. 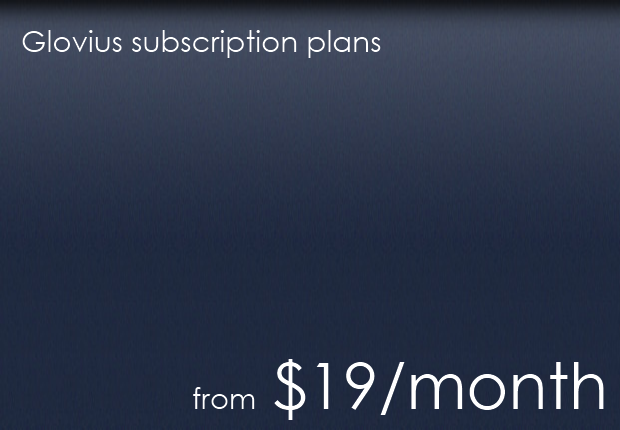 Plans start at $19/mo. Control costs and reduce capital outflow. Make 3D data available to more people in your organization in a cost effective and transparent way. Define a clear ROI for your projects. No maintenance or support contracts to worry about. Get started at no cost, with a free 7-day trial. Compare plans and signup for the plan of your choice. Write to us at support@glovius.com with your feedback and queries.